Type using your Pebble! Tertiary text presents a solution for a quick and efficient method of entering text using only the Pebble itself. 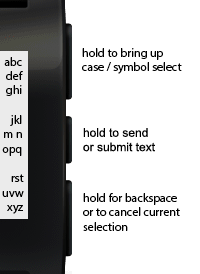 By fully utilizing the three buttons and narrowing down the selection each time, it is possible to hit all twenty-six characters of the alphabet in three button strokes. It looks a little clunky at first, but in almost no time the letters become muscle memory and your speed greatly improves. On the start screen, all 26 letters + the space are shown in three groups of nine, one group corresponding to each button. Selecting the top button then, for example, breaks it down into the group of nine, dividing that one into three groups of three, again one group for each button. The second click will then do the same thing to the selected group, making three groups of one letter each. The third and final click will then select the letter that it corresponds to, and successfully type it! 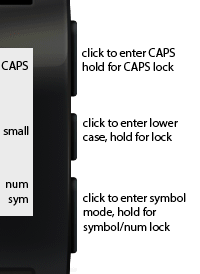 The center button can be configured to perform any custom action, and is not a specific part of Tertiary Text. In some messaging apps (seen below) the center button hold is used to send, in Pebble Notepad it's used to save your work. You can play with the .pbw files below to get a feel for how it works. Tertiary Text is designed as an implementable API. If you want to see it used in one of your favorite apps, pester the developer! That being said, a sample implmentation of Tertiary Text (.pbw) is available here. The application is called Pebble Notepad, and will allow you to take notes using only your Pebble. Data is stored persistently, and can be cleared by holding the middle button. The source code for it is also included below, so you can see how to work with and use Tertiary Text. An older .pbw for SDK 1.x is also available. Developers have started incorporating Teriary Text with awesome results! An official API may be on its way in the future, but as for now it isn't so hard to look at the code and incoorperate it. Thank you tocsick! Tertiary Text can be easily invoked as a pop up window in your application by simply adding two files to your existing application, and calling the tertiary_text_prompt function. After the text has been sent, your application will receive the input string via a callback function. More details on this is available in the readme file. A simple example of an application that logs the typed text is available here. It will output the typed input to the log. For more information about Pebble logging, see here. Q: Are you able to type space? You can contact me best at vgmoose [at] gmail.com. Thank you for checking out this project– any and all support is welcome. If you have suggestions/criticisms you can shoot me an email as well.